Coca-Cola Zero Sugar, also called Coke Zero Sugar, is a diet cola produced by The Coca-Cola Company. In some countries it is sold as Coca-Cola No Sugar. The drink was introduced in 2005 as Coca-Cola Zero as a new no-calorie cola. In 2017, the formula was modified and the name updated, a change which led to some backlash. Coca-Cola Zero was Coca-Cola's largest product launch in 22 years. The global campaign was done by creative agency Crispin Porter + Bogusky. It was marketed as having a taste that is indistinguishable from standard Coca-Cola, as opposed to Diet Coke, which has a different flavor profile. In 2017, despite increasing sales in the United States, the Coca-Cola Company announced that Coca-Cola Zero would be reformulated and rebranded as Coca-Cola Zero Sugar, intended to taste more like standard Coca-Cola while emphasizing the lack of sugar content. The new formula was first tested in the United Kingdom in June 2016, with plans to roll it out in other countries in the following months. The move caused some vocal backlash. The Washington Post noted Coke Zero is very popular, and that fans compared the change to the launch of New Coke in 1985. However, Beverage Digest executive editor Duane Stanford noted that it was very similar in flavor, and that the formula likely was tweaked only slightly as the ingredients list is the same. He noted that the rebranding was the main emphasis. In Australia, the soda was relaunched as "Coca-Cola No Sugar" in 2017 but had trouble gaining initial acceptance. The original Coca-Cola Zero logo generally featured the Coca-Cola logo in red script with white trim, with the word "zero" underneath in lower case in the geometric typeface Avenir (or a customized version of it). These words appeared on a black background. Some details varied from country to country. Later packagings swapped the colors of the "Coca-Cola" script and "Zero", leaving the former in white and the latter in red. The Coca-Cola Zero Sugar logo features the Coca-Cola logo in white script, with the words "zero sugar" in black underneath. The word "zero" is in lower case in the geometric typeface Avenir (or a customized version of it); the word "sugar" is in upper case. These words appear in a red disc on a black background. All versions of Coca-Cola Zero Sugar sold in various countries are based on the same flavoring formula, and all are carbonated. One liter of Coca-Cola Zero contains 96 mg caffeine. Additionally, artificial sweeteners are used. In the U.S., this includes aspartame and acesulfame potassium. However, the exact combination of sweeteners and preservatives used varies from market to market. Sodium cyclamate, a relatively inexpensive artificial sweetener banned by the U.S. Food and Drug Administration (FDA) since 1969 and once believed to be a carcinogen, has been used in the Coca-Cola Zero versions produced in Germany, Italy, Spain, Portugal, Venezuela, Chile, and some Central American countries. It was used for a time in Mexico, before a consumer campaign led to its removal from the drink in 2008. In June 2009, Venezuela ordered Coca-Cola to withdraw its Coca-Cola Zero product, as it contained more than the legal levels of sodium cyclamate. Coke Zero was originally specifically marketed to men, who are shown to associate "diet" drinks with women. It was primarily marketed towards young adult males and it has been nicknamed "Bloke Coke" in the UK. In the U.S., advertising has been tailored to its targeted market by describing the drink as "calorie-free" rather than "diet", since young adult males are said to associate diet drinks with women. U.S. marketing also emphasized its similarity in taste to sugared Coca-Cola; an advertising campaign for the beverage focused on Coca-Cola executives who were so angry over the drinks' similarities, they were considering suing their co-workers for "taste infringement". Continuing the theme, a Coca-Cola Zero ad aired during Super Bowl XLIII parodied Coke's iconic "Hey Kid, Catch!" commercial, which is interrupted by two Coca-Cola "brand managers" accusing Troy Polamalu of "stealing" their commercial. In Australia, the product's launch was promoted by a fake front group; the campaign included outdoor graffiti and online spamming that mentioned a fake blog. Once exposed, consumer advocates assailed the campaign as misleading and established the Zero Coke Movement to comment on the ethics of Coke's activities. Coca-Cola Zero sponsors Bundesliga club Borussia Dortmund, the NASCAR Sprint Cup Series Coke Zero 400 at Daytona International Speedway in July, and also the Suzuka 8 Hours in Japan, a motorcycle endurance race. In 2013, Coca-Cola swapped the logo on Coca-Cola, Diet Coke and Coke Zero bottles and cans in many European countries with 150 of the most popular local names for a summer-long "Share a Coke" campaign. The same campaign was used in North America the following summer. For Christmas 2013, Coke Zero launched an interactive website that allowed people to customize the designs of their Christmas sweater, which have a significant role in United Kingdom Christmas traditions. On the website, people could detail the cut, pattern, and icons for their sweater,  and join a popularity contest. Users could choose from Christmas trees and Santa’s head, to reindeer, sleighs, and turkeys. This initiative was tied to a social media campaign, where the top 100 sweater designs with the most votes were manufactured and shipped to the contest winners. According to the Coca-Cola Company, the website generated nearly 42,000 sweater designs in its first four days. Caffeine-Free Coca Cola Zero Sugar 2010 Coca-Cola Zero Sugar without caffeine. First released in France in February 2010 as Coca-Cola Zero Sans Cafeine  It was later released in Japan as Coca-Cola Zero Free in April 2010. In the Netherlands, Belgium, Greece and Luxembourg as Coca-Cola Zero Caffeine Free since the start of 2011 and in the US since July 2013. Coca-Cola Cherry Zero Sugar 2007 Coca-Cola Zero Sugar with cherry flavor. Introduced in the US in late January 2007 and was widely available throughout the United States before its official debut, which occurred on February 7, 2007 at New York City's Fashion Week. It was launched in the UK in 2014. In 2017 it was launched alongside with Coca-Cola Lemon Zero Sugar in Luxembourg, Poland and Belgium. Coca-Cola Vanilla Zero Sugar 2007 Coca-Cola Zero Sugar with additional vanilla flavor. Introduced in the US in June 2007 concurrently with the relaunch of Coca-Cola Vanilla, and was later introduced in the UK in 2017. It has also been sold in Australia, New Zealand and Belgium. Coca-Cola Lemon Zero Sugar 2017 Coca-Cola Zero Sugar with additional lemon flavor. It has been sold since 2017 in Italy, Luxembourg, Belgium, Norway, Netherlands, Sweden, Poland and Israel. Coca-Cola Peach Zero Sugar 2018 Coca-Cola Zero Sugar with peach flavor. Released in the United Kingdom in 2018. Coca-Cola Clear 2018 A 'clear' version of Coca-Cola Zero Sugar, with a hint of extra lemon. Released in Japan in 2018. Coca-Cola Raspberry Zero Sugar 2018 Coca-Cola Zero Sugar with raspberry flavor. Released in Norway in 2018 and the UK in 2019. Coca-Cola Cinnamon Zero Sugar 2018 Coca-Cola Zero Sugar with extra cinnamon flavor. Released in the United Kingdom, Poland, Lithuania and Estonia in 2018..
Coca-Cola Orange Vanilla Zero Sugar 2019 Coca-Cola Zero Sugar with an orange vanilla flavor. Made available nationwide in the United States on February 25, 2019. ^ "What's the Difference Between Coke Zero and Coca-Cola Zero Sugar?". coca-colacompany.com. August 4, 2017. Retrieved August 30, 2017. ^ "RIP Coke Zero? New drink Coca-Cola No Sugar launching in Australia". ^ "Coke Zero : Ingredients : Nutrition : GDA - Coca-Cola GB". Coca-cola.co.uk. April 13, 2010. Retrieved January 24, 2014. ^ a b Judkis, Maura (July 27, 2017). "R.I.P., Coke Zero: The five stages of ice-cold grief". Washington Post – via washingtonpost.com. ^ a b Spence, Shay (July 26, 2017). "People Are Very, Very Upset About the Demise of Coke Zero". People. ^ a b Hickman, Martin (July 4, 2006). "Introducing 'Bloke Coke' - is this now the real thing?". The Independent. London. Retrieved June 12, 2009. ^ "Coke No Sugar: Closer than ever to the classic Coca-Cola taste". The Coca-Cola Company. Retrieved June 17, 2017. ^ a b Chang, Olivia (July 26, 2017). "Coca-Cola is replacing Coke Zero with a new drink". CNNMoney. ^ Willis, Jay (July 26, 2017). "We're About to Lose the Best Soda the World Has Ever Known". ^ Tucker, Alexa (July 31, 2017). "Coke Zero Is Being Replaced by Coke Zero Sugar and People Are Outraged". Self. ^ Bomey, Nathan (July 27, 2017). "Coke Zero out, Coca-Cola Zero Sugar in due to recipe change". Retrieved December 22, 2018. ^ Brook, Benedict (February 22, 2018). "Coke No Sugar is supposed to be replacing Coke Zero. But Australians aren't playing along". ^ "How much caffeine is in Diet Coke, Coca‑Cola and Coke Zero? : FAQ - Coca-Cola GB". Coca-cola.co.uk. April 13, 2010. Retrieved January 24, 2014. ^ "Diet Coke vs. Coca-Cola Zero: What's The Difference?". The Huffington Post. AOL. November 1, 2012. Retrieved December 28, 2013. ^ "Should Men's Products Fear a Woman's Touch?". HBS. November 13, 2013. ^ Tungate, Mark (2008). Branded Male: Marketing to Men. London and Philadelphia: Kogan Page Limited. pp. Chapter 3. ISBN 978-0-7494-5011-3. ^ a b c Elliott, Stuart; March 5, 2007; "Can’t Tell Your Cokes Apart? Sue Someone"; The New York Times; retrieved March 6, 2007. ^ Hinds, Julie (February 2, 2009). "Super Bowl ads deliver big laughs". Detroit Free Press. Retrieved March 20, 2015. ^ "Coke to reprise 'Mean Joe' commercial for Super Bowl". Atlanta Business Chronicle. Retrieved March 20, 2015. ^ "Tantillo’s Branding Bite: Pepsi Goes Online (Exclusively)" Marketing Doctor Blog. March 20, 2008. ^ "Coke Gets A Zero For Effort" Marketing Doctor Blog. January 25, 2006. ^ "The Zero Movement". Tim Longhurst. Retrieved July 24, 2006. ^ "The Zero Coke Movement". Archived from the original on July 18, 2006. Retrieved July 24, 2006. ^ "Coca-Cola Gets Personal in Europe with "Share a Coke" Campaign". Brandchannel.com. May 15, 2013. Retrieved January 24, 2014. ^ "Coke Zero's Digital Sweater Generator Calls on Your Inner Knitter". AdWeek. November 2013. ^ "Coca-Cola Amatil records sweet result". The Sydney Morning Herald. May 3, 2006. Retrieved February 8, 2007. ^ "Companhia lança Coca-Cola Zero no Brasil". Archived from the original on September 28, 2007. Retrieved January 16, 2007. ^ "Coca Cola Zero llega a su fin en Chile". ADN Radio Chile. January 8, 2018. Retrieved January 11, 2018. ^ "Entertainment :: Coke Zero launched in Jamaica :: June 16, 2009". The Jamaica Star. June 16, 2009. Retrieved October 22, 2012. ^ "Handelsbladet Fk – Kraftig satsing på sukkerfri brus". Archived from the original on October 20, 2007. Retrieved October 13, 2006. ^ "Coca-Cola Zero chega segunda-feira". Retrieved May 17, 2005. ^ "Coca-Cola España prepara el lanzamiento de Coca-Cola Zero". Marketing News. Retrieved February 17, 2010. 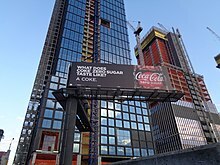 Wikimedia Commons has media related to Coca-Cola Zero.